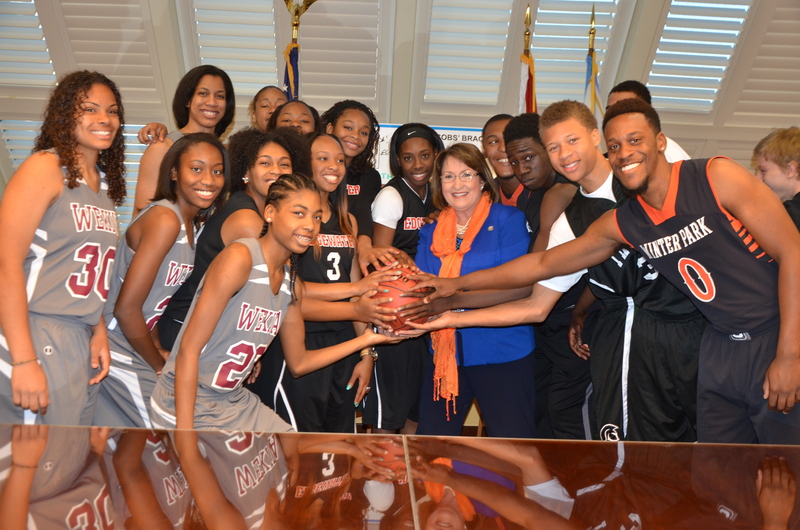 Orange County, FL – This morning, Orange County Mayor Jacobs called in the experts — student athletes from four local winning high school basketball teams — to help her with her NCAA bracket selections. On hand to assist the Mayor were basketball champions from Winter Park (boys), Evans (boys), Edgewater (girls) and Wekiva (girls) High Schools. The experts all agreed it would be Florida all the way. “One great Florida university, FSU, brought home the National Football Championship this year, so I feel excited and confident to predict another great center of learning, the University of Florida, is going to match that achievement by bringing home the National Basketball Championship,” said Mayor Jacobs. The students assisted in creating Mayor Jacobs’ bracket for the NCAA 2014 Basketball Championship games, which will be held at the Amway Center on Thursday, March 20 and Saturday, March 22. The participating students were selected by their high school principals. Student athletes arrived at the Orange County Government Administration Center in their team uniforms and gathered in the Mayor’s Conference Room to go over the NCAA 2014 Basketball Championship brackets and the picks for Mayor Jacobs. WKMG Local 6, hosts of the NCAA 2014 Basketball Championship games, and Orange TV recorded the bracket selection. The footage is available from Orange TV via our FTP site. Please point your FTP client to ftp://ftp.orangetvfl.org/News Username: otvguest Password: vision1* The file to download is labeled: Mayor Jacobs NCAA Brackets.mp4. A variety of photos from the event are also available for use by the media and are located on Flickr.